The golden retriever was initially bred as a working dog, but then someone found out that they make amazing family companions, too! These lovable pups deserve the best, and we’ve researched and reviewed top dog food options to help you put together a great meal for your golden retriever. Before you jump into the reviews, check out these specs to consider while you compare! Food Type - In these reviews, we focused on dry dog foods, since it’s pretty expensive to feed a large breed on wet food exclusively! Dog Age - Dog foods can be formulated for specific age ranges or for all life stages, including puppy, adult, and senior dogs. Package Size - How much are you getting? Knowing the available package sizes can help you compare value across different brands. Dehydrated - Dehydrated dog food is a variant on the raw dog food craze that can be easier to store and preserve. Main Protein - If you want to avoid certain protein sources or to shake things up with a non-typical protein, pay attention to this spec! Made In - We looked for dog foods that are made in the USA, because they have great quality control and regulations. Now that you know what to look for, let’s get into the reviews! The top pick and budget pick summarize the overall winners and best value options, but we also reviewed eight other amazing dog foods for your consideration that suit the needs of golden retrievers. It’s time to find your canine companion’s new favorite kibble! The Wellness Complete Dry Food for large breeds is made only in the USA and provides high-quality nutrition for your adult golden retriever. Although this is our top pick for adutls, Wellness also makes some of the best food for golden retriever puppies in their Large Breed Complete Health for Puppies line. This adult dog food line has a larger kibble size for grown-up large breed dogs and is free from corn, wheat, soy, and meat by-products. The Chicken & Rice recipe contains deboned chicken, deboned whitefish, chicken meal, and salmon meal as the top protein sources--no by-products or “mystery poultry!” Glucosamine and chondroitin are added into the mix to support healthy joints, which is especially important for golden retrievers. Fruits, vegetables, and vitamin and mineral supplements provide total nutrition to support a healthy and active lifestyle. And bags up to 30 pounds ensure you’re getting great bang for your buck! Choose from three delicious recipes from Rachael Ray’s Nutrish dry dog food line: Real Beef & Brown Rice, Real Chicken & Veggies, and Turkey, Brown Rice, & Venison. 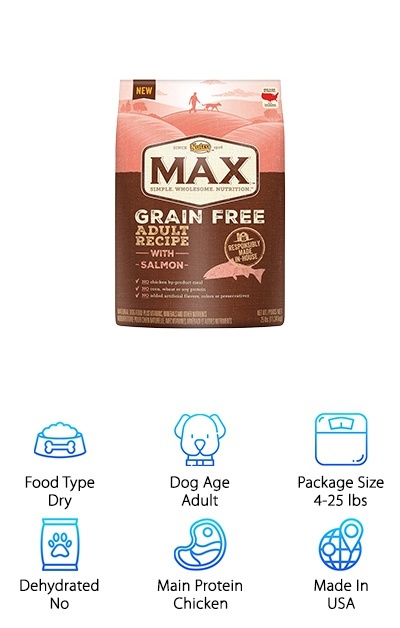 If you want to avoid dog foods with poultry by-product meal, wheat, and wheat gluten, this is a great option that’s also available at a low price. It’s definitely a great pick for the best dog food for golden retriever puppies, adults, and seniors thanks to the high-quality ingredients and proteins with no fillers, artificial flavors, or artificial preservatives. Prebiotics and beet pulp provide fiber for healthy digestion, while peas, carrots, and other vegetables provide vitamins, minerals, and additional fiber. If you’re concerned about finding the best puppy food for golden retrievers, this dry dog food designed for all life stages may be a good way to get the best value and quality combination out of your dog food! Some golden retrievers are prone to allergies and sensitivities that show up as itchy, flaky skin and other symptoms. Grains are a common allergy, but a more difficult allergy to deal with is chicken, which is found in most dog foods. If you need to avoid chicken in dog food, you’ll be relieved to find the Taste of the Wild Formula, which has several recipes with no chicken or poultry meat ingredients. These chicken-free recipes include Venison, Salmon, Lamb, and Boar, while the Wildfowl and Bison & Venison recipes contain some amounts of chicken meal. Plus, every recipe is grain-free! Fruits, vegetables, probiotics, and nutrient supplements provide total nutrition with carbohydrates sourced mainly from sweet potatoes or potatoes. This high-quality, high-protein dog food is ideal for active dogs, especially those with grain or chicken allergies. It’s a great way to indulge your golden retriever’s hidden inner wolf! Lamb meal is an amazing and under-utilized dog food ingredient that can be easier to digest than other meat protein sources. 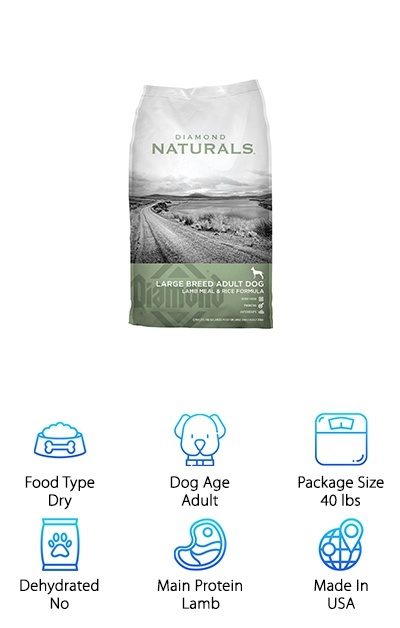 Diamond Naturals Large Breed Lamb & Rice recipe is ideal for dogs that don’t tolerate chicken well, although it does contain some chicken fat as a source of fatty acids. You can also try out the chicken recipe if your dog doesn’t have a problem with chicken. With no corn, wheat, or soy, this dog food is an excellent option for golden retrievers with skin allergies and sensitivities, which can often be due to grain allergies. Glucosamine and chondroitin help to support joint health, an important consideration with goldens. Probiotics and fiber from beet pulp encourage healthy digestion. 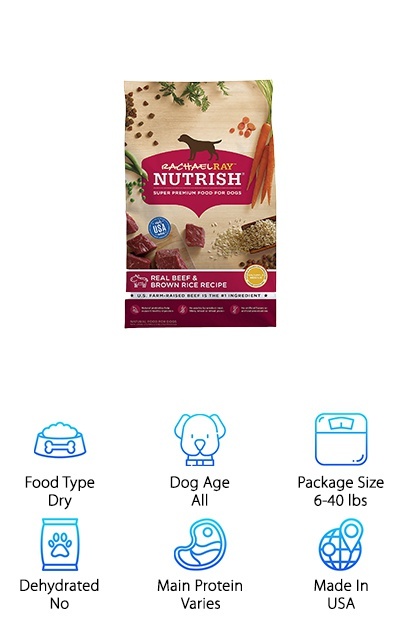 This dog food contains a wealth of vitamins and minerals in their pure form, which can be a good option if you want a dog food with limited ingredients that still provides total nutrition. 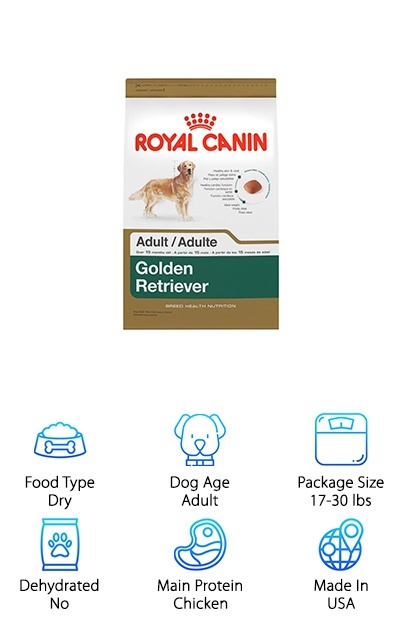 If you want some of the best dog food for golden retrievers that is specifically designed for the breed, Royal Canin has the kibble for you! 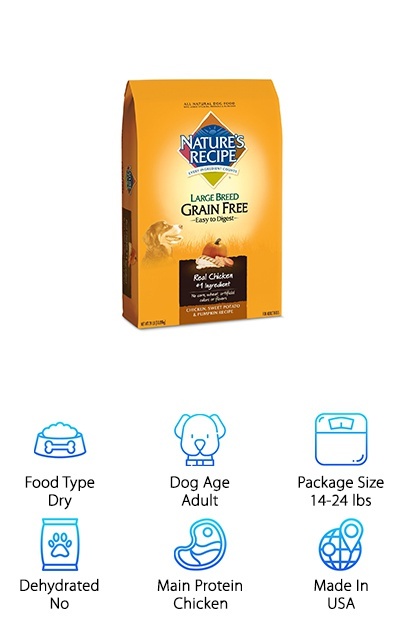 This recipe is designed for adult golden retrievers over 15 months old, but this brand also offers a great choice for the best puppy food for golden retrievers if you have a younger dog. The kibble shape helps encourage your golden retriever to chew their food to improve digestion. Nutrients like EPA and DHA from anchovy oil support skin and coat health, which is ideal for the sensitive skin tendencies and allergies of golden retrievers. Plus, EPA, DHA, and taurine supplements in the kibble also support a healthy heart. One of the few health problems golden retrievers are prone to is cardiac disease, so these supplements are a great choice for goldens. Overall, this breed-focused formula is a high-quality option for the needs of golden retrievers! Is your pup slowing down or looking a little plump around the middle? 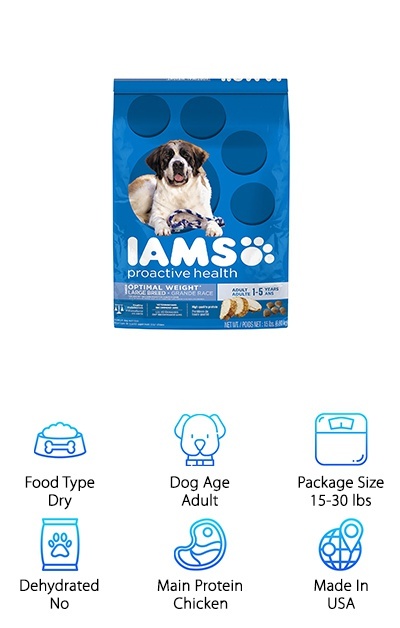 Iams Optimal Weight dog food for large breeds is a good choice for helping your golden retriever stay trim while still getting all of the nutrition they need. This formula contains 17% less fat than the Iams Proactive Health Chunks, and includes L-Carnitine to help burn fat and keep their metabolism functioning at optimal levels. Chicken and eggs provide protein, while beet pulp provides fiber to keep their digestive system moving. Besides having essential vitamins and nutrients, this dog food is free from soy, wheat, fillers, and artificial dyes and preservatives. Biotin and fatty acids sourced from chicken fat encourage healthy, moisturized skin, strong nails, and a soft coat. Other vitamins include vitamin E, A, B2, B6, B12, and D3 to support your golden retriever’s immune system, joints, and more! This dog food is a great option for keeping a less active dog in good shape, which is ideal for their longterm health. Chicken is a common main protein source in dog food, but lamb is a rare option that this dog food from Eukanuba provides as the main protein source. This premium ingredient tends to be easier to digest for most dogs and is a great choice for dogs who have sensitive stomachs. On top of that, beet pulp and prebiotic FOS provide fiber and help to improve the absorption of nutrients. Chicken by-product meal provides glucosamine and chondroitin for joint health, and fish meal supplements oils rich in omega-6 and omega-3 fatty acids for skin and coat health. Your golden retriever’s coat can look its best when they’re getting the oils and hydrating nutrients to they need promote healthy hair growth. 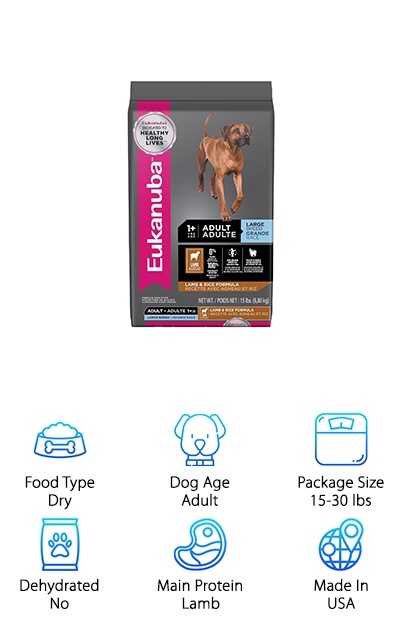 Eukanuba is a high-quality source for dog food that provides complete nutrition and protein with no fillers. They also offer another large breed recipe with chicken. Nutro Max Grain-Free dog food for adult dogs is a great choice for golden retrievers with sensitive stomachs or intolerances to grains like corn and wheat. Choose from Salmon, Lamb, or Chicken recipes, each featuring chicken as the main protein source, supplemented with different amounts of lamb meal, deboned lamb, salmon, and salmon meal. Potatoes, chickpeas, and peas provide grain-free sources of carbohydrates, while beet pulp provides fiber to improve digestion. Vitamins like vitamin B1, A, E, D3, B6, and B12 support your dog’s health from nose to tail, and it’s all made in the USA! It has a great value among grain-free dog foods along with a high dose of protein and great flavors to help encourage your golden retriever’s active lifestyle. It’s a great choice for dogs with allergies or sensitivities to corn, wheat, or soy, or dogs prone to sensitive stomach issues as well. 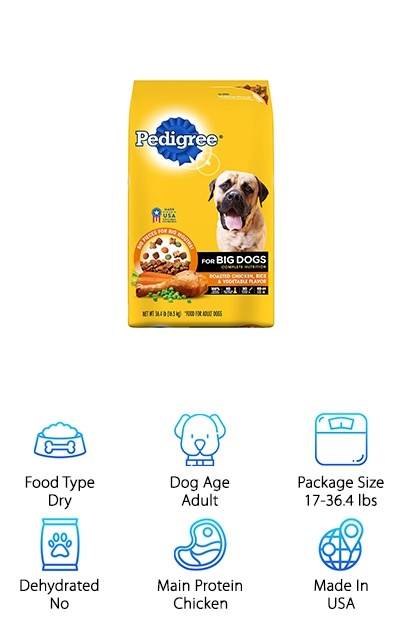 This large breed dog food from Pedigree is available in 17-, 30, and 36.4-pound bags. This dog food derives most of its protein content from chicken, with meat, bone, and poultry by-product meal providing glucosamine, calcium, and chondroitin for joint and bone health. Golden retrievers as a breed don’t have many health issues, but they are more likely to suffer from joint disease. Fiber helps keep digestion easy, and other nutrients like omega-6, antioxidants like vitamin E, and more help to support the immune system, skin, and coat health. Keep in mind that if your pup has allergies or sensitivities to corn or other grain products, this dog food contains corn and wheat as carbohydrate sources. 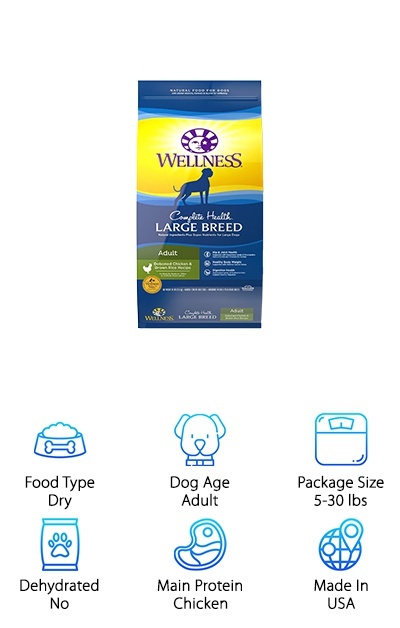 This dog food offers a solid nutritional base and a great value thanks to the large package size options. It also helps clean your dog’s teeth and limit tartar and plaque! 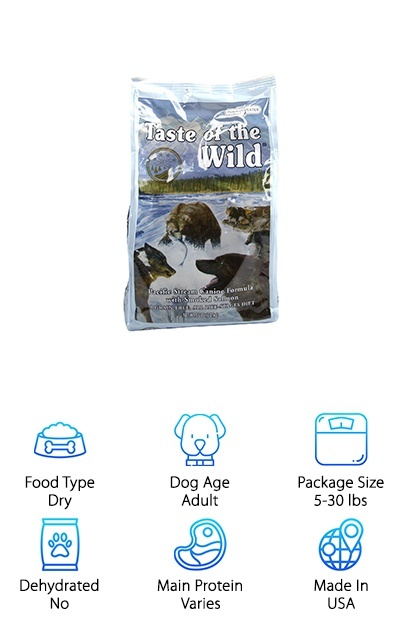 This grain-free adult dog food from Nature’s Recipe is designed for the nutritional needs of adult dogs over 50 pounds. Instead of wheat or corn, your dog receives digestive support and carbohydrates from sweet potato, peas, and pumpkin. Chicken and chicken meal provide high-quality protein without animal by-products or by-product meals, and a blend of vitamins and minerals provide total support for your dog’s health. Golden retrievers can lead very active lifestyles, and it’s important to find a dog food that provides plenty of protein and other supports! If your golden retriever has a wheat or grain intolerance, that makes Nature’s Recipe an especially good choice! It’s also easy to digest and a good option for dog owners who just want to avoid grains in favor of alternatives like sweet potato and pumpkin. This formula helps large dogs maintain strong muscles and joints to keep them active!